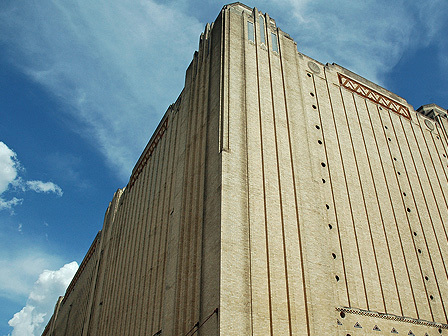 The Texas & Pacific Warehouse was constructed in 1931 as a part of a three building complex along Fort Worth’s Front Street, renamed Lancaster Avenue for Texas & Pacific Railway’s President, John Lancaster. In addition to the warehouse, the complex includes the Texas & Pacific Railway Terminal and the United States Post Office, designed by Fort Worth architect Wyatt C. Hedrick. The eight-story warehouse is a muted version of the taller and more embellished passenger terminal building. Both buildings have elements of the Zig-Zag Moderne style present in the early Art Deco period. The Texas & Pacific Warehouse is endangered due to neglect and lack of maintenance. Currently the basement is filled with several feet of water. Previous owners had started renovations to the building and left the building open to damage from water. If the building is not maintained, the integrity of the reinforced concrete structure will eventually be compromised by the infiltration of water.